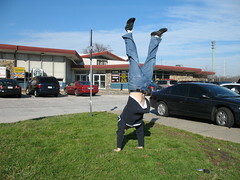 I went up to NYC with some friends and I didn't have a Delaware handstand yet. This is sad... we need to represent Delaware better. I mean, they do have tax free shopping.